Home of: Richard Kimble by Mark Bennett is one of the greatest pieces of fantasy map art I’ve ever seen, and I encountered it hanging inside a Microsoft office building. 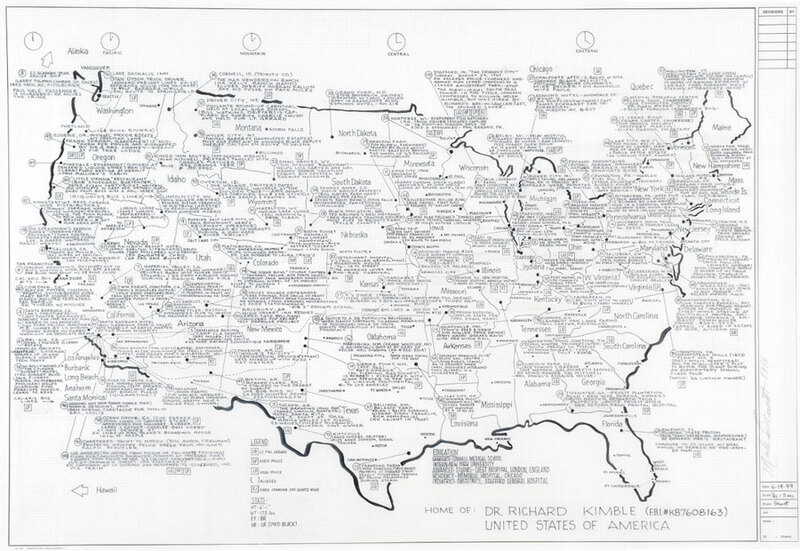 * It’s also featured in Katharine Harmon’s book The Map as Art. Fantasy art and cartographic art get around. I spent a little time before writing this trying to categorize this artwork using Wikipedia. It doesn’t fit Wikipedia’s description of lowbrow art; it’s not outsider art; nor is it truly naive art, since it clearly exploits an established body of technique. I guess the art world hasn’t yet gotten around to categorizing fantasy cartography, which is fine by me. So it’s a map of a TV show, but it’s also a map of our United States. In that sense, it’s as much a portrait of our world as, say Bruegel’s Landscape with the Fall of Icarus is a portrait fo Breugel’s world. 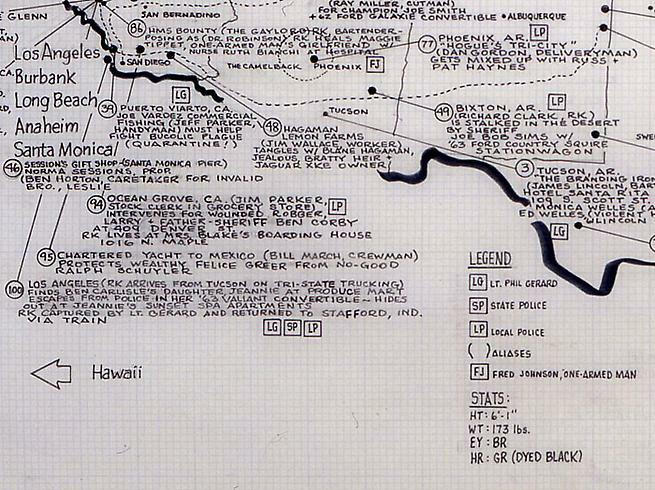 The map is also a technical triumph by any cartographical standard. It is executed 100% within the strict conventions of a functional map. It’s dense with detail. Each entry includes location, Richard Kimble’s alias at the time, the names of major protagonists, and the involvement of law enforcement in the scene. 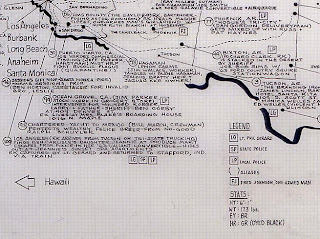 But the map also purposely strains the limits of legibility. The closer you look, the harder it is to really make sense of the story. The entries are dangerously cramped in certain areas. The faint dotted lines that presumably mark the progress of the chase of Richard Kimble disappear behind the text, challenging you to follow them. When you look this close, the illusion that this map is a bare representation of fact begins to break down. You start to see disjunction between the real United States and the progress of a fictional journey. But the illusion never breaks all the way. The map stays right on the line between the factual and the impossible, and that’s what makes this a really great fantasy map. It’s fun to look at, dense with information, flawlessly executed, thoughtful, and deeply informed by its subject matter: a truly great map. * Microsoft has a spectacular art collection, including some stunning works that I'd call fantasy cartographic art. Update E. Tage Larsen points out in the comments that this form of art can be properly termed Information Graphics or Information Design! "I guess the art world hasn’t yet gotten around to categorizing fantasy cartography, which is fine by me." actually, we do. it's called Information Graphics, or Information Design. Have a gander at the Edward Tufte books, but obviously awesome info design and cartography extends back to cave walls, etc. I have read Tufte, but I guess it never occured to me to apply Information Graphics as the name of an artistic genre. It totally fits, though. Thinking of that, it's probably time to get Tufte out of the library and read him again.